I’ve been in travel for 20 years - I first started in Lunn Poly, then moved to the Co-op group, then I finally joined Premier Travel in Newmarket in 2013 – from here I became branch manager at Halstead, and I’m now branch manager at Bishops Stortford. I love travelling! Every day is different; I enjoy finding what the customer wants and then exceeding their expectations. Plus, there are so many lovely places to see in the world! Where have you travelled to…? All of the Balearic islands, all of the Canaries, Rhodes, Corfu, Crete, Portugal, Sorrento, Cyprus, Mexico, Barbados, St Lucia, Jamaica, Antigua, The Cayman Islands, The Bahamas, Egypt, Dubai, Mauritius, St Thomas & St Martin, Martinique, Las Vegas, Los Angeles, Florida, Barcelona, Venice, Jersey, Brussels, Amsterdam, Copenhagen, Austria, Croatia, Cuba, Havana & Varadero. I’m about to go to Austria skiing again - I’m heading back to Seefeld. It’s a beautiful, stunningly picturesque, chocolate box village – you can sleigh ride around the frozen lake, plus there’s an Olympian centre, so you can swim surrounded by the snow and the valleys overlooking the ice skating rink. The people there are lovely, plus it’s a short flight - I have been twice already! Lake Louise in Canada – it looks incredibly beautiful and I’ve never been to Canada before; I’d like to do Banff, Whistler and Vancouver. I would love to go to New York – I’ve never been and the sights look so enticing. I’ve only ever heard lovely things about it from friends and family – I think the whole atmosphere would be brilliant and I’d love to see a show on Broadway too. A cruise! 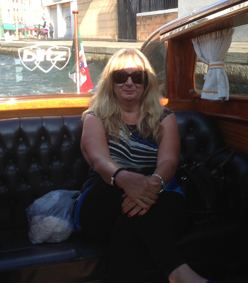 Not to one particular place but to lots of destinations – I went to Croatia and Italy on the P&O Ventura, my favourite stop was Venice – it’s so romantic and appealing, the architecture and the food are both wonderful. Sailing into Venice! It was quite emotional for me, it was a beautiful sunny day and it just took my breath away. Either that or swimming with dolphins in Mexico – that was just amazing and something I’ll always remember. I always try to go the extra mile for my clients – you won’t leave disappointed! A copy of my passport & travel insurance documents.